Wow, what an amazing week we’ve had – the weather has been just fabulous and now Rosalie has started walking (woo hoo, super proud mummy!) we’ve been enjoying plenty of leisurely strolls together. I wonder if being on the cusp of walking was making her extra cranky which is why we had a couple of bad weeks, but this week she’s been (mostly) back to her jolly self, which is such a relief. 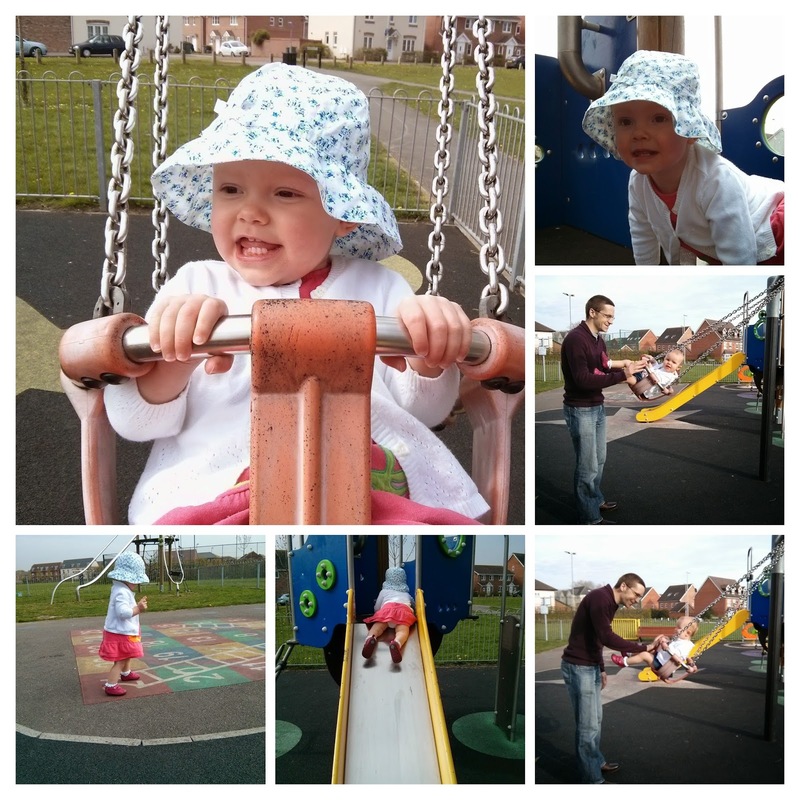 Out and about this week has pretty much entirely consisted of trips to the park. Rosalie is really enjoying the new-found independence that comes with being able to walk, and after a quick go on the swings she likes to walk around and choose what to go on next. At the moment her favourite is the climbing frame and slide.which she does all by herself. We’ve spent a lot of time in the garden this week thanks to the glorious weather. Our grass is a little long, but it didn’t stop Rosalie from practicing her walking and we had some fun with bubbles too (another thing ticked off the Spring Bucket List). Friday was a little chilly so we enjoyed some indoor play in the morning with our dyed rice – this time I sat Rosalie at the table and spread some of the rice onto a tray so that we could make patterns and draw shapes. I’m so pleased I made the dyed rice, we’ve had good mileage out of it and it keeps Rosalie amused for a while. Plus, the cleanup is minimal! On Saturday I met a mummy friend (sans little ones) for tea and cake at a quirky little local tea shop. It was nice to catch up as we don’t see each other as often since she returned to work. We inevitably end up talking about the girls a lot, but it’s nice to be able to finish a conversation! I’ve been spending most of Rosalie’s naps this week sanding and painting a bargainous cabinet I nabbed on eBay last week. Might not sound much like me time, but I actually love doing this sort of thing, so I’ve really enjoyed myself. I’ll post a photo once it’s done. Definitely seeing Rosalie walking all by herself. She’s been walking holding on for so long I thought she’d never find the confidence to let go, but it just suddenly happened. It was like a switch flipped in her brain and she woke up one day realising that if she was walking it would be so much easier to carry stuff around. I took a video, it’s not amazing but I just feel so proud of her. 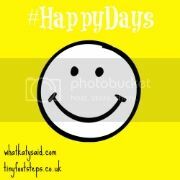 Check out my other Happy Days posts so far and join in too. 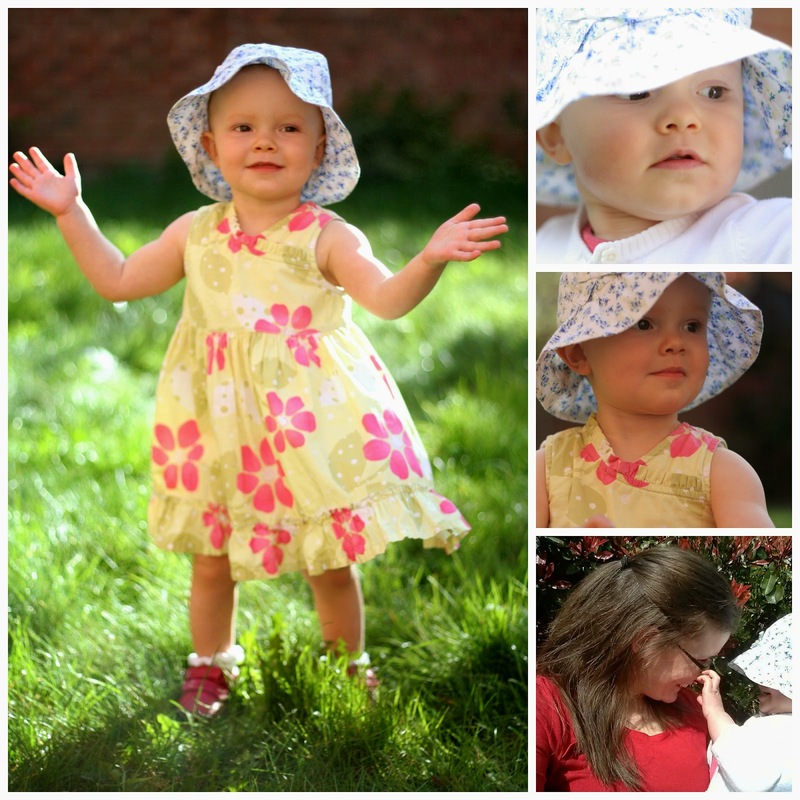 #HappyDays is hosted by Katy from What Katy Said and Jenna from Tinyfootsteps. Woohoo! Well done Rosalie, that's wonderful – and it makes so much difference to what they can do when they start scampering around! Yay well done Rosalie 🙂 how lovely! Sound like such a lovely week, I love your park photos she looks so proud of herself! Thanks Carie, it's already making such a difference, coupled with this sunshine we're having a wail of a time! I'm so glad you had a good week, I really hoped you would. I think you might be right about her almost walking being the cause of the grumpiness. I love your photos this week, especially the ones taken in your garden! Go Rosalie!! Aw, she's just so cute. We've had such perfect weather for lots of outdoor walking practice, haven't we? Ohh cannot wait to see your cabinet when it's done. 🙂 I love doing things like that too. It really is, she even attempted a small run today – funny and scary at the same time! Now daddy has mowed the lawn the garden is even better for walking practice! !